NBC4 tagged along as Gardena police surprised 8-year-old "honorary officer" Erick Casillas with some Christmas cheer Friday morning. A Southern California boy with a severe terminal illness was greeted with a special holiday treat on Friday morning – with the help of the Gardena Police Department. Dozens of officers first visited the home of 8-year-old Erick Casillas on Thursday night, after they had heard the boy wanted to be a police officer someday. Erick was given a brand new police badge and treated as an honorary officer – but police noticed that something was missing in the family home. “A Christmas tree. How can you have Christmas without a Christmas tree? ?” said Police Chief Edward Medrano. An Orange County family is trying to help others after their daughter died from a rare, aggressive form of brain cancer. A sample of McKenna Wetzel's tumor was donated to a lab at Stanford University in hopes of finding a cure and preventing other families from going through the same heartache. Dr. Bruce Hensel reports for the NBC4 News at 5 p.m. on May 1, 2013. Erick’s brother Cristian explained that because Erick needs round-the-clock care and can no longer walk, it’s difficult for the family to make time to do anything else. So Gardena police stepped in to help get the Casillas family home into the holiday spirit. Friday morning, NBC4 tagged along as police delivered a Christmas tree to the Casillas home, along with lights, ornaments, and even an angel to sit atop the tree. 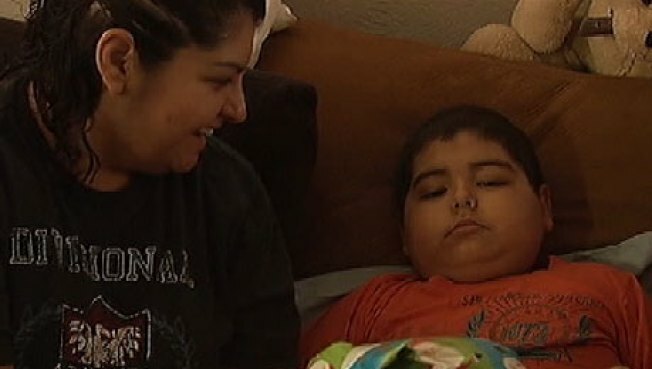 Read: Make-A-Wish foundation helps 5-year-old boy with leukemia become "Batkid"
The family does not want to disclose what terminal illness Erick is suffering from, but NBC4 was told it recently took a turn for the worse – and that he only has few days left to live.